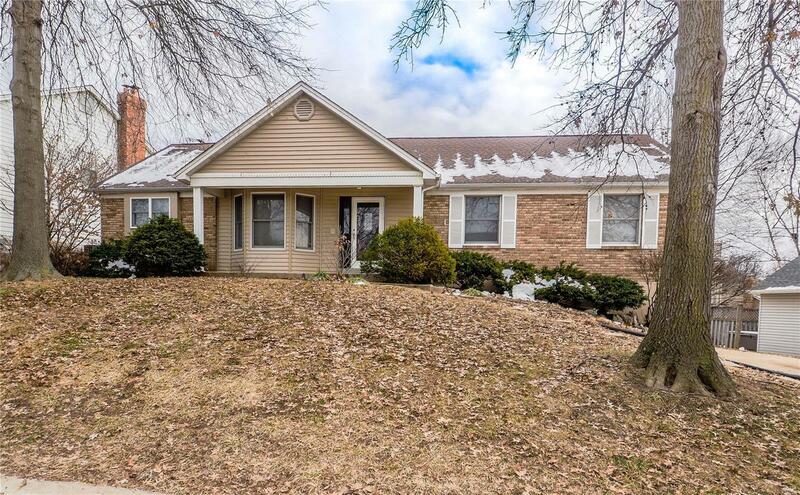 Fantastic 4 bedroom ranch with open floor plan, finished lower level, large lot and 3 car over-sized garage with the potential to hold 6 cars. This clean, move-in ready home is in the desirable Wellington Farms subdivision with convenient access to HWYS 94/364/40. This home features new carpet throughout including lower level, ceramic tile in the kitchen, laundry room and bathrooms, and hardwood flooring in the entry. The kitchen offers stainless steel appliances (refrigerator stays), island and custom bench. The great room features vaulted ceilings with fireplace and wet bar and walks out to the large deck perfect for entertaining! Enjoy tons of extra space it the lower level which offers an extra bedroom, bathroom and family/recreation room that walks out to the spacious backyard. The 4th bedroom was converted to a den with beautiful cherry built-in bookshelves but would also make a gorgeous nursery, great extra tv room or fun play room for the kids!